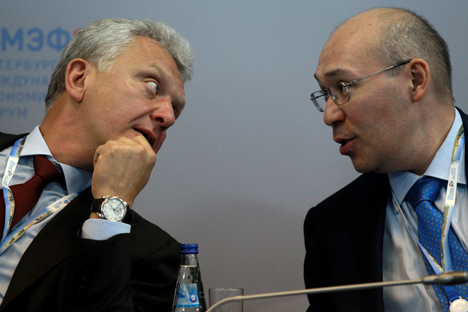 Russia has benefited most from growing trade within the Customs Union, but the organization risks repeating the EU's mistakes if it doesn't build effective institutions, according to Eric Berglof of the EBRD. Russian and Western officials universally lauded the Customs Union of Belarus, Kazakhstan and Russia at a panel on economic integration at the St. Petersburg International Economic Forum (SPIEF). “In 2012, Russia's trade growth within the Customs Union significantly overtook its growth in the rest of the world,” said Tatiana Valovaya,Minister for Integration and Macroeconomics of the Eurasian Economic Commission (EEC). "A number of important economic links that existed between Soviet republics have been lost in the last 20 years," said Maria Makarova, Marketing Director of the B2B Center. "Today e-commerce is helping restore those links." “The EU is cautious about economic integration with the Customs Union because they feel that they have different values,” said Alexander Rahr, Senior Consultant at Wintershall. The Customs Union of Russia, Belarus and Kazakhstan came into existence on January 1, 2010 as part of an attempt to create a single EU-type Eurasian Economic Space by 2015. In July 2011 customs borders were removed between the three countries, leading to surging trade levels. Other countries that have expressed interest in joining the EEC include Armenia, Kyrgyzstan, Tajikistan, Ukraine and Vietnam. Former US Secretary of State Hillary Clinton denounced the EEC as an attempt by Russia to reassert control over the post-Soviet space.